Between 1965 to 1967 Mahmoud Reda and his team of dancers and music documentors did many “field trips to research and document the dance events and characteristic movement found in the provinces of Egypt”² He has confided in me that in many areas he would go to in order to do research would not give him much movement to work with, little to inspire him towards choreography for the theater. But Sa’idi Tahtib and assaya were singularly special. 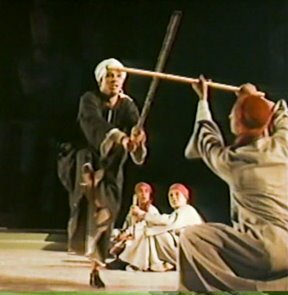 Not only were Mahmoud’s choreography and staging artistic and sophisticated, but his strong, graceful dance was also appealing to most all tastes. There were also two other aspects that sold the Sa’idi audience on his abilities to represent their movement. 1) Sa’idi men could recognize that he knew what he was doing and could recognize which city his movements were from. 2) His strength and balance (in a now signature move) while he kneeled on the floor with one leg extended then arose with the still extended.³Men knew how difficult that was. In this case Mahmoud had an advantage, as he had been an Olympic Gymnast with medals in “Floor Exercise”. “Love in Karnak” “El Binty Beida” The important strength move is at 2:03. Mahmoud often told the story of how he learned from a Tahtib master; as he learned the swings and near hits in the martial arts contest, the master would constantly tell Mahmoud that he was never to actually make contact. Lessons lasted for hours a day, for many days. ¹ Many personal conversations between 1984-2013 in California (1984-1987) and Cairo, Egypt (1989-2013). ² Farida Fahmy in “Dancing is My Life” Farida Fahmy and Mahmoud Reda. Bibliotheca Alexandrina, Alexandria, Egypt. ³ Private conversations with many Egyptians, including Sa’idi, explaining to me who Mahmoud Reda is to the people of Egypt. It most difficult to give comments on the wonderful research work you have done on all of Egyptian dances. You are the only one who has dared to go far. I love the work you are doing. At the moment I’m working to save money for your next trip in February 2015. I have taken your J to E 1 & 2 when you taught in San Francisco at Amina’s Studio. Please keep sending me information. I study and place all the reading materials in the binder that you gave us .